I used this finish on the hundreds of jumpers I constructed when I owned and operated a maternity wear design and manufacturing company in the early 80’s. I knew I had to have something yellow this spring, it seemed like the freshest color in all the magazines and on the runways. 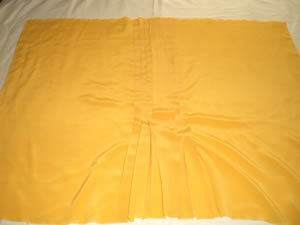 And, several of the sewists on the sewing blogs have been making cute yellow tops (check out, www.ericabunker.com/2008/04/ive-got-yellow-fever.html ) When I saw this beautiful silk Crepe de Chine in a sunflower yellow, I grabbed it! I didn’t have any particular pleating arrangement in mind, so I chose a pattern with the shape I wanted and cut a piece of fabric long enough for the front piece and just started fooling around. I thought it would be easiest to pleat the fabric first and then cut the front pattern piece. 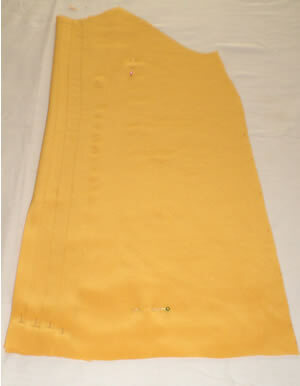 I ended up with a 1″ pleat at the center front and 3, 1/2″ pleats on either side. I used Simplicity 3874, view B, because I liked the neckline and the raglan sleeve. 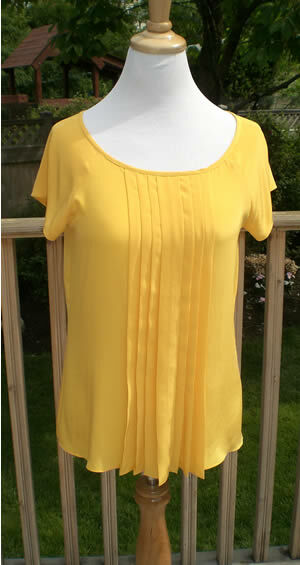 I cut if off to blouse length, folded out the front dart and omitted the empire elastic. 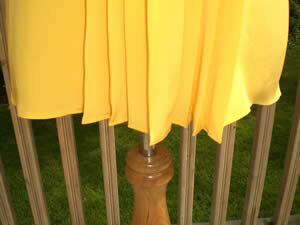 I stitched-down the pleats to withing 6″ of the hem. This way the blouse will look good un-tucked or tucked-in. 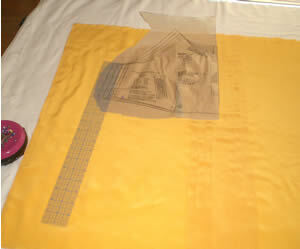 I took the original pattern piece and folded out the dart (that’s why the paper pattern looks so wrinkly. Don’t worry about that, just lay the pattern on the fabric and pin it as flat as possible). I put the center front of the pattern piece in the middle of my center pleat. I drew a new side seam line, following the original pattern, easing into the armhole. I drew the new bottom hem. After drawing the left side, I folded the fabric on the center front and cut the right side, following the lines of the left side. 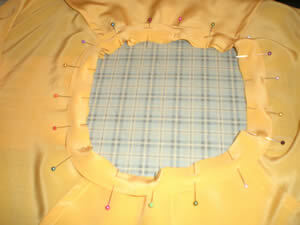 The back pattern piece only needed shortening, no other alterations. 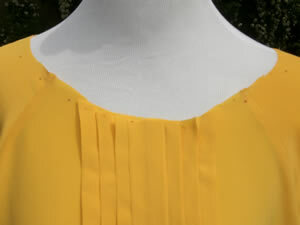 Step 4, construction: I constructed the top according to the pattern directions, except for the sleeves and neckline. The sleeve: I cut 4 sleeves and lined them, understitiching at the hem. This avoided narrow hemming the bottom of the sleeves which would have given them a fluttery look. 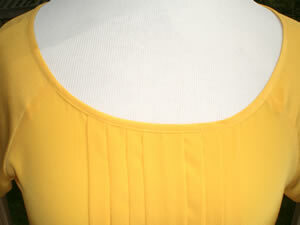 The raglan sleeve has a curved seam in the middle. Next time, I’m going to fool around with the shape of that seam because I’ll bet that it can altered to pull the sleeve in more at the hem. It’s a nice sleeve the way it is, but I would prefer it to be a little more fitted at the hem. The neckline: after the sleeves were finished, I tried it on and I re-cut the neckline into a broader, deeper boat shape. Step 5, finishing: I struggled with this. I knew I didn’t want a neckline facing that would pop out and wouldn’t give the pleating any support, I decided on a foldover bias trim. 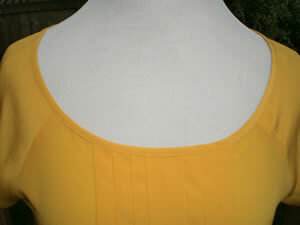 My plan was to make a bias strip, fold it in half, lengthwise, press and then sew it to the wrong side of the neckline. This gives plenty of allowance for error and still make a nice even topstitched fold-over on the right side. Problem was, I didn’t have enough fabric to cut the bias strip in one piece. So, I cut 2 pieces and proceeded to try to make the seams fall on each shoulder seam. Well, I don’t know if there is a computation for this, I tackled it by sewing one seam in the bias strip and pinning this seam, matching at the shoulder, then pinning the remainder of the neckband until I reached the other shoulder seam. At this point, because the seam on the bias strip would be a diagonal seam, I didn’t know how to make the band exactly the right length. I did my best to guesstimate, then sewed the diagonal seam, but–oops! I sewed a chevron seam instead of a straight one. Of course, I’d cut off the excess, so now I had a band that was too short. I had to re-cut one side of the bias strip to create a straight seam and create a continuous band. Voila! It worked! After sewing on the band, I trimmed the seam allowance very carefully to a consistent 1/8″, which gave me a stable, even edge on which to turn the band to the outside and topstitch carefully. Somehow, the band seams ended up symmetrically located–thank you god! Now, for the hem. I’ve had a wonderful top-of-the line Bernina for 15 years and I had never purchased a narrow hemming foot! The problem with narrow hemming the other way (turning and stitching, trimming and turning and stitching again) is that by the time you stitch around the hem twice on delicate fabric, it almost always starts to flutter. I’ve been anxious to have a garment to on which to try out my new hemming foot. I also used a technique I saw on a very expensive designer silk skirt (Project MyWay #1). 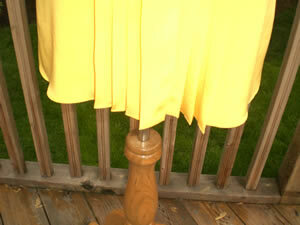 The skirt front was narrow hemmed, the skirt back was narrow hemmed, then the side seams were sewn. If you’re careful to have the side seams of the fronts and backs end at exactly the same place, this gets around the fact that the first half inch in of a hem using a narrow hemming foot looks horrible, as it’s hidden in the side seam. …it’s turning out very nicely. Of course I couldn’t find a bright print like the one here for a top, but the yellow blouse with black slacks will look great with this jacket!